Today the feast of St. Teilo, bishop, is celebrated in Wales. According to the 1962 Missal of St. John XXIII the Extraordinary Form of the Roman Rite, today is the feast of St. Cyril of Alexandria, bishop and doctor, and St. Apollonia, virgin and martyr. St. Cyril's feast in the Ordinary Form of the Roman Rite is celebrated on June 27th. St. Apollonia was a young martyr of Alexandria. She was arrested and executed in about 250 during a riot provoked against the Christians. Her executioners broke all her teeth. She is invoked for the cure of a toothache. According to tradition Teilo, or Elios as he was sometimes known, was born about the year 480 AD at either Gumfreston or Penally in south Pembrokeshire. He studied under Paulinus at Ty Gwyn where he met Dewi (Saint David), the two becoming firm friends. Later, the two set out on a pilgrimage to Jerusalem and en route were joined by Padarn. Upon their return home, Teilo was given charge of the church at Llandaff and the surrounding area. Shortly afterwards there was an outbreak of Yellow Fever and Teilo led his followers to Cornwall to escape its effects. From Cornwall they travelled to Brittany where they were welcomed by Archbishop Solomon of the Church of Dol. They stayed for seven years, during which time Teilo and his followers are said to have planted three miles of fruit trees. He returned to Llandaff where he ministered for many years. He died in 566 AD. Several churches in south Wales and Brittany are dedicated to St Teilo. He is depicted on a fifteenth century stained glass window in a church at Plogonnec, Finistére, and also in a statue in the Chapel of Our Lady, Kerdévot. In both cases he is shown wearing bishop's robes and mitre and seated on a stag, suggesting, as was the case with many other saints of the time, that he had an affinity with the natural world. Patron: Horses and fruit trees. Visit this interesting site which gives you information about the picturesque and ancient town of Llandeilo, Wales as well as St. Teilo. Read more about St. Teilo here. The Martyrology reads: "At Alexandria the holy virgin Apollonia—under the Emperor Decius (249-251) her teeth were beaten out; then the executioners built and lit a funeral pyre, and threatened to burn her alive unless she would repeat their blasphemies. After some reflection she suddenly tore herself loose from her tormentors and threw herself into the flames. The fire of the Holy Spirit that glowed within her was more intense than the burning pyre. Her executioners were astounded to see a weak woman willingly embracing death with such determination before they were ready to carry out their threats." The saint was already well on in years. An account of St. Apollonia's martyrdom was written by Bishop Dionysius of Alexandria (died 265), a contemporary. She is honored as the patroness against toothache. Apollonia, it might seem, committed suicide. Her act was used by the ancients as proof that it is permitted to escape dishonor or persecution through voluntary death. But the most authoritative moralists, including Saint Augustine, declare that even in such cases suicide is not permitted, and seek to justify Apollonia's heroic act by assuming that she acted according to a special mandate from God; without such a divine injunction no one is allowed to follow her example. The saints are not to be imitated on every point. Patron: Dentists, tooth disease, toothache. Symbols: Deaconess holding a set of pincers which often holds a tooth; gilded tooth; pincers grabbing a tooth; pincers; tooth and a palm branch; tooth; woman wearing a golden tooth on a chain. 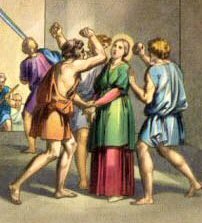 Pray to St. Apollonia for a courageous and holy death. The elderly especially may beseech her to strengthen their faith as they weaken and approach death.